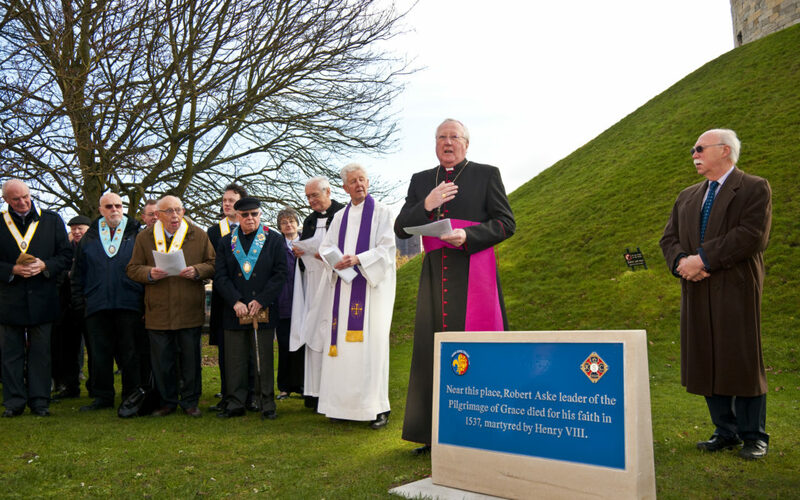 Bishop Terry unveiled a plaque in honour of martyr and Pilgrimage of Grace leader Robert Aske near the place of his execution in York. The plaque, near Clifford’s Tower, was a joint project between York Civic Trust and the Knights of St Columba. Aske, a lawyer, objected to Henry VIII’s religious reforms, especially the Dissolution of the Monasteries, and he ended up leading the growing revolt in Yorkshire, Northumberland, Durham and other areas. Thousands of insurgents marched on York and Aske met the king and was given assurances that their concerns would be addressed. However, Henry later had Aske seized and convicted of high treason in London. He was taken back to York where he was hanged in chains on a scaffold outside of Clifford’s Tower in 1537. York Civic Trust is a membership organisation open to all who wish to protect and enhance York’s architectural and cultural heritage. The trust has been placing commemorative plaques on buildings since the late 1940s and there are now around 80.